KJV: Servants, be subject to your masters with all fear; not only to the good and gentle, but also to the froward. NLT: You who are slaves must accept the authority of your masters. Do whatever they tell you--not only if they are kind and reasonable, but even if they are harsh. According to the Bible, to whom are we to be submissive, and why? Servants (3610) (oiketes from oikos = house) means one who lives in the same house as another and then household slaves or domestic servants not as strongly servile as doulos. Many of these household or domestic slaves were well educated and held responsible positions in the households. Many of them were doctors, teachers, musicians, actors and stewards over great estates. The oiketes or household slave describes one who generally holds closer relations to the family than other slaves. He is one of the household of the “family” and yet to promote order he too is called by Peter to submit to those in authority. Oiketes is used 4 times in the NASB and is always translated as servant or servants. Deut 34:5 So Moses the servant (Hebrew = 'ebed; Lxx = oiketes) of the LORD died there in the land of Moab, according to the word of the LORD. William Barclay - To understand the real meaning of what Peter is saying we must understand something of the nature of slavery in the time of the early church. In the Roman Empire there were as many as 60,000,000 slaves, Slavery began with Roman conquests, slaves being originally mainly prisoners taken in war, and in very early times Rome had few slaves but by New Testament times slaves were counted by the million. It was by no means only menial tasks which were performed by slaves. Doctors, teachers, musicians, actors, secretaries, stewards were slaves. In fact, all the work of Rome was done by slaves. Roman attitude was that there was no point in being master of the world and doing one's own work. Let the slaves do that and let the citizens live in pampered idleness. The supply of slaves would never run out. Slaves were not allowed to marry; but they cohabited; and the children born of such a partnership were the property of the master, not of the parents, just as the lambs born to the sheep belonged to the owner of the flock, and not to the sheep. It would be wrong to think that the lot of slaves was always wretched and unhappy, and that they were always treated with cruelty. Many slaves were loved and trusted members of the family; but one great inescapable fact dominated the whole situation. In Roman law a slave was not a person but a thing; and he had absolutely no legal rights whatsoever. For that reason there could be no such thing as justice where a slave was concerned. Aristotle writes, "There can be no friendship nor justice towards inanimate things; indeed, not even towards a horse or an ox, nor yet towards a slave as a slave. For master and slave have nothing in common; a slave is a living tool, just as a tool is an inanimate slave." 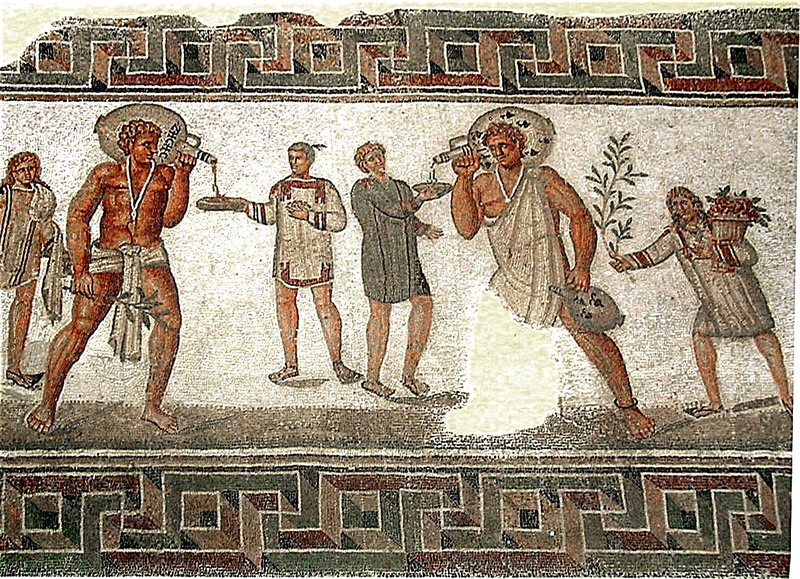 Varro divides the instruments of agriculture into three classes--the articulate, the inarticulate and the mute, "the articulate comprising the slaves, the inarticulate comprising the cattle, and the mute comprising the vehicles." The only difference between a slave and a beast or a farmyard cart was that a slave happened to be able to speak. Peter Chrysologus sums the matter up: "Whatever a master does to a slave, undeservedly, in anger, willingly, unwillingly, in forgetfulness, after careful thought, knowingly, unknowingly, is judgment, justice and law." In regard to a slave, his master's will, and even his master's caprice, was the only law. The dominant fact in the life of a slave was that, even if he was well treated, he remained a thing. He did not possess even the elementary rights of a person and for him justice did not even exist. Into this situation came Christianity with its message that every man was precious in the sight of God. The result was that within the Church the social barriers were broken down. Callistus, one of the earliest bishops of Rome, was a slave; and Perpetua, the aristocrat, and Felicitas, the slave-girl, met martyrdom hand in hand. The great majority of the early Christians were humble folk and many of them were slaves. It was quite possible in the early days that the slave should be the president of the congregation and the master a member of it. This was a new and revolutionary situation. It had its glory and it had its dangers. In this passage Peter is urging the slave to be a good slave and a faithful workman; for he sees two dangers. (i) Suppose both master and servant became Christians; there arose the danger that the slave might presume upon the new relationship and make an excuse for shirking his work, assuming that since he and his master were both Christians, he could get away with anything. That situation is by no means at an end. There are still people who trade on the goodwill of a Christian master and think that the fact that both they and their employers are Christians gives them a right to dispense with discipline and punishment. But Peter is quite clear. The relationship between Christian and Christian does not abolish the relationship between man and man. The Christian must, indeed, be a better workman than anyone else. His Christianity is not a reason for claiming exemption from discipline; it should bring him under self-discipline and make him more conscientious than anyone else. (ii) There was the danger that the new dignity which Christianity brought him would make the slave rebel and seek to abolish slavery altogether. Some students are puzzled that no New Testament writer ever pleads for the abolition of slavery or even says in so many words that it is wrong. The reason was simple. To have encouraged the slaves to rise against their masters would have been the way to speedy disaster. There had been such revolts before and they had always been quickly and savagely crushed. In any event, such teaching would merely have gained for Christianity the reputation of being a subversionary religion. There are some things which cannot happen quickly; there are some situations in which the leaven has to work and in which haste is the surest way to delay the desired end. The leaven of Christianity had to work in the world for many generations before the abolition of slavery became a practical possibility. Peter was concerned that Christian slaves should demonstrate to the world that their Christianity did not make them disgruntled rebels but rather workmen who had found a new inspiration towards doing an honest day's work. It will still often happen that, when some situation cannot at the time be changed, the Christian duty is to be Christian within that situation and to accept what cannot be changed until the leaven has worked. But Christianity did not leave the matter in that merely negative form. It introduced three great new principles into a man's attitude as a servant and a workman. (i) Christianity introduced a new relationship between master and man. When Paul sent the runaway slave Onesimus back to Philemon, he did not for a moment suggest that Philemon should set Onesimus free. He did not suggest that Philemon should cease to be the master and that Onesimus should cease to be the slave. What he did say was that Philemon must receive Onesimus not now as a servant, but as a brother beloved (Philemon 1:16 ). Christianity did not abolish social differences; but it introduced a new relationship of brotherhood in which these other differences were overpassed and transformed. Where there is real brotherhood, it does not matter if you call one man master and the other servant. There is between them a bond which transforms the necessary differences which the circumstances of life make necessary. The solution of the world's problems lies in the new relationship between man and man. (ii) Christianity introduced a new attitude to work. It is the conviction of the New Testament that all work must be done for Jesus Christ. Paul writes: "Whatever you do in word or deed, do everything in the name of the Lord Jesus" (Colossians 3:17). "Whether you eat or drink, or whatever you do, do all to the glory of God" (1 Corinthians 10:31). In the Christian ideal work is not done for an earthly master or for personal prestige or to make so much money; it is done for God. It is, of course, true that a man must work in order to earn a wage and he must work to satisfy a master; but beyond that there is for the Christian the conviction that his work must be done well enough to be able to show it to God without shame. While an individual was a slave, he was in most respects equal to his freeborn counterpart in the Graeco-Roman world, and in some respects he had an advantage. By the 1st cent. A.D. the slave had most of the legal rights which were granted to the free man. Sepulchral inscrsiptions of the 1st and 2nd centuries indicate the prosperity and family solidarity of the imperial slave. Many had a considerable amount of money at their disposal and had rights to wife and family. In A.D. 20 a decree of the Senate specified that slave criminals were to be tried in the same way as free men (Just. Dig. 48. 2. 12. 3). Pliny the Younger treated the wills of his slaves as valid on the ground that the master’s house was the substitute for the state (Ep. 8. 16. 2; 8. 24. 5). In A.D. 61 the family of a slave owner attempted to use an old prerogative: the execution of all of the slaves of the master, who had been killed by one of them. When the family of Pedanius Secundus ordered this, so great a riot broke out when the report reached Rome that troops had to be called in to quell it, and the slaves were not killed (Tac. 14. 42. 45). There was also the interesting incident that took place during the reign of Hadrian. The emperor was attacked by an insane slave, but, instead of being put to death, the slave was turned over to the care of a physician (Script. Hist. Aug., Hadrian 12. 5). The living conditions of many slaves were better than those of free men who often slept in the streets of the city or lived in very cheap rooms. There is considerable evidence to suggest that the slaves lived within the confines of their master’s house. They usually lived on the top floor of their owner’s city house or country villa (Cil. Phil. 2. 67; Colum. Rust. 1. 63). In Pliny’s Laurentian villa the quarters for the slaves and freedmen were in separate sections of the house, but were considered attractive enough to be used for the entertainment of overnight guests (Plin. Ep. 2. 17. 22). At Pompeii in one villa, the Casa del Menandro, separate quarters for slaves were provided on one side of the building. These rooms were on the second floor, included a kitchen and a latrine, and were connected to the rest of the house by a long corridor (Maiuri, Casa del Menandro 1. 186-188). The slave was not inferior to the free man of similar skills in regard to food and clothing. That most slaves at Rome were as well dressed as free men is indicated in an unusual way. Seneca stated that legislation was introduced in the Senate that slaves should be required to wear a type of clothing that would distinguish them from free men (Sen. de Clementia 1. 24. 1). It is presumed that the slave ate as well as the poor free man but there is no direct evidence on the subject. At least it is hard to believe that a master would provide well for his slaves in other ways and not feed them well. Be submissive (5293) (hupotasso from hupó = under + tasso = arrange in orderly manner) means literally to place under in an orderly fashion and was a military term meaning “to arrange in order under” a commanding general and thus being subject to his orders. Submission is to a position of authority rather than to a person. Hupotasso means to be placed under in an orderly fashion (Click 1Peter 3:1 for more detail on "hupotasso"). Submission focuses not on personality but position. We need to see authority over us not acting on their own, but as instruments in the hand of God. If we look at people as acting on their own we will eventually become bitter, but if we can see them as acting as God allows, we will become holy. A beautiful example of this is found in the life of Joseph. His brothers consistently mistreated him and it would have been very easy for him to become bitter at them. Yet he had a divine perspective on the whole situation and it helped him become a holy man of God. And as for you, you meant evil against me, but God meant it for good in order to bring about this present result, to preserve many people alive. (Ge 50:20). Peter's instruction here regarding a servant's submission continues his previous charge for all (no exceptions here!) believers to submit themselves "for the Lord's sake to every human institution" (1Peter 2:13-note). This same motivation would (for the Lord's sake) certainly apply to the institution of slavery and slaves to their masters. Application: The problem of taking advantage of one's employers is still present with us. Some think that because their bosses are Christians, they have the right to slough off on the job. Peter is saying that God expects Christians to be the best workers a boss (master) could ever ask for. Christianity should make us more conscientious than others. Masters (1203) (despotes; English = despot) means one who possesses undisputed ownership and absolute, unrestricted authority, so that the Greeks refused the title to any but the gods. The despotes was one who has legal control and authority over persons, such as slaves. In the NT despotes & kurios are used interchangeably of God, and of masters of servants. In Greek culture and terminology, servant and despótēs went together. It is notable that three times the saints use despotes when prayerfully entreating their Sovereign (Lk 2:29; Ac 4:24; Rev 6:10). The English word despot often congers up a negative image of one who exercises power tyrannically, harshly or abusively, but the Biblical uses do not convey such a connotation. Despotes is one who has legal control and authority over persons, such as subjects or slaves and was used especially as the ruler over a household. Despotes -10 times in NAS translated: Lord, 3; Master, 3; masters, 4. In summary, 6x despotes refers to God or Jesus and 4x to human masters. Comment: When persecution hit the first thing the early church did was to acknowledge God's authority and power as greater than the power of the Sanhedrin. Is praise to my Despotes for His omnipotence my reflex reaction when I am persecuted for Christ's sake? 1 Timothy 6:1 All who are under the yoke as slaves are to regard their own masters as worthy of all honor so that the name of God and our doctrine will not be spoken against.2 Those who have believers as their masters must not be disrespectful to them because they are brethren, but must serve them all the more, because those who partake of the benefit are believers and beloved. Teach and preach these principles. 2 Timothy 2:21+ Therefore, if anyone cleanses himself from these things, he will be a vessel for honor, sanctified, useful to the Master, prepared for every good work. Comment: Implication? Believers are servants! Servants submit their rights. How are you doing? 1 Peter 2:18 Servants, be submissive to your masters with all respect, not only to those who are good and gentle, but also to those who are unreasonable. 2 Peter 2:1+ But false prophets also arose among the people, just as there will also be false teachers among you, who will secretly introduce destructive heresies, even denying the Master who bought them, bringing swift destruction upon themselves. Comment: Implication? Believers are not their own but have been bought or purchased! Are you living for your SELF or your SAVIOR? It will make a lot of difference in your enjoyment of this life and the one to come (cf 1 Ti 4:7-8+)! Jude 1:4+ For certain persons have crept in unnoticed (Very picturesque verb = pareisduo from para = beside + eis = into + duo = go down, sink = literally means to go into and alongside of, to settle down alongside those already there. In short to slip in secretly as if by a side door! ), those who were long beforehand marked out for this condemnation, ungodly (asebes = depraved conduct and their corrupt doctrine as if God did not exist) persons who turn the grace of our God into licentiousness (aselgeia = twist Christian liberty into license) and deny our only Master and Lord (kurios), Jesus Christ." Comment: Implication? What are we doing when we choose to live by a list of rules? Are we not in effect denying our Master and the grace He generously gives to carry out whatever He calls us to accomplish? Revelation 6:10-note and they cried out with a loud voice, saying, "How long, O Lord, holy and true, will You refrain from judging and avenging our blood on those who dwell on the earth?" Comment: Implication? Pay day will come someday for all who reject God's children because they reject Christ! Do not be deceived for a day of divine avenging is coming! Corollary: Believer, don't seek to take your own revenge! Your command is to forgive! Only possible by the enabling power of the Spirit of Christ! Jettison self reliance and rely fully on Spirit power to live a super-natural life! Comment: In this context we see the disciples using despotes as a reflection of God's sovereignty or control over Creation (and by implication over any opposition they might experience to the proclamation of the gospel). Paul and Peter are both conveying the foundational truth that how believers act while under the authority of another affects how people view the Gospel, the message of salvation. . Displaying a proper attitude of submission and respect, and performing quality work, help make the Gospel message believable. “UNDERNEATH ARE THE EVERLASTING ARMS": "God—the eternal God—is Himself our Support at all times, & especially when we are sinking in deep trouble. There are seasons wh… en the Christian sinks very low in humiliation. Under a deep sense of his great sinfulness, he is humbled before God till he scarcely knows how to pray, because he appears, in his own sight, so worthless. Well, child of God, remember that when thou art at thy worst and lowest, yet “UNDERNEATH” thee “ARE EVERLASTING ARMS.” Sin may drag thee ever so low, but Christ’s great atonement is still under all. You may have descended into the deeps, but you cannot have fallen so low as “the uttermost”; and to the uttermost he saves (Hebrews 7:25KJV). Again, the Christian sometimes sinks very deeply in sore trial from without. Every earthly prop is cut away. What then? Still underneath him are “THE EVERLASTING ARMS!” He cannot fall so deep in distress and affliction but what the covenant grace of an ever-faithful God will still encircle him. The Christian may be sinking under trouble from within through fierce conflict, but even then he cannot be brought so low as to be beyond the reach of the “everlasting arms”—they are underneath him; and, while thus sustained, all Satan’s efforts to harm him avail nothing. so that you can speak in with your lips! The fact that Peter singles slaves out for special admonition indicates that slaves, as a class, formed a large part of the early Christian community (by some estimates there were over 60 million slaves in the Roman empire). In Paul’s day, women, children, and slaves had few rights. In Christ however they had freedom that society denied them. Paul explained how masters and slaves should live out the dichotomy of being on different social levels yet one (equal) in Christ. Some newly converted slaves may have reasoned that their spiritual freedom also guaranteed personal and political freedom, and this line of reasoning created problems for themselves and the churches. Paul dealt with this problem in (1Cor 7:20ff), and also touched on it in his letter to his friend Philemon. As a sidelight it is interesting (and encouraging) to note that the Gospel eventually overthrew the Roman Empire and the terrible institution of slavery, even though the early church did not preach against either one! With all respect - Peter could have stopped with "Servants be submissive" but he adds this qualifying phrase. With all respect (en panti phobo) is literally in all fear where respect is the Greek word phobos which means fear but in this context conveys the idea of a reverence toward their masters that induces respect and faithfulness to one's duty. It is an attitude of "healthy fear" which motivates the slave to conduct themselves in a manner that pleases their masters on earth and their Master in heaven. It does not mean in dread of punishment from the master. God wants all believers to have respect for the system of authority in the employer/employee relationship. A reverence for God our true final Master should engender and motivate and empower (by the Spirit) a heart desire to not speak or do anything that would impugn the name of our Lord, and it is this underlying principle which "drives" our desire to submit "respectfully" (in reverential fear) to all those in authority over us! How are you doing with those whom God has placed over you? Application: As a born again believer, our job is full-time Christian service wherever we are placed. If we disagree with management, God wants us to do it "in all fear." To respect authority does not mean that we must respect the person. It does mean that we respect the authority that they represent. What should it mean to be a Christian employer? Why does the Bible allow slave owners to beat their slaves? What does it mean to be a slave to sin? What is a bondservant / bond-servant? How can we experience true freedom in Christ? Not only - Watch out for the flesh driven tendency to submit with respect to only those who you think "deserve it!" Good (18) (agathos) refers to inner or intrinsic goodness as seen from the outside by a spectator. Many of the masters were not despots as our English word usually conveys (tyrannical, abusive, etc) but were good at heart and were benevolent, kind and generous to their slaves. Thayer defines epieikes as "mildness, gentleness, fairness, sweet reasonableness." Vincent says epieikes means "not unduly rigorous, not making a determined stand for one’s just due." The word reasonable sums up well the meaning of epieikes. This is simply a testimony to the saint’s status as a citizen of the Kingdom of God, for in that kingdom there is no anarchy or rebellion, but instead the perfect harmony that comes from a thoroughly organized and disciplined order. In other words, all believers are to exhibit a microcosm of the peaceful and respectful conditions that will prevail in the eternal kingdom, a kingdom that will run in perfect order under one autocratic (benevolent despotic) head-God. Christian employees are to be advertisements for the Kingdom they represent. The rider to v18 makes it plain that the character of their employer is not a factor in determining their behavior. But - Always be alert for term of contrast which mark a change of direction. Use "but's" (>4000 in NAS!) as an opportunity to "PPP" (pause and ponder the passage)! What is the change of direction? Why? Why now? What does it mean? etc. Learn to query the text and you will be amazed at how the Spirit will speak to you! Unreasonable (4646) (skolios from skéllō = to dry) refers to that which is bent or warped from dryness. Skolios literally refers to that which is bent, crooked, curved or winding. The more frequent use in the NT and the Septuagint (Lxx) is figuratively where skolios refers to a perversity for turning off from the truth and so that which is morally crooked, bent or twisted and thus unscrupulous (unprincipled), dishonest, unfair, perverse. In the present verse the context conveys the figurative use of severe, hard to deal with, overbearing, unjust, bad-humored, cruel, ill-tempered, unfair, dishonest, cross or harsh. The medical condition scoliosis involves an abnormal curvature and misalignment of the spine. One’s Christianity does not give the right to rebel against one’s superior in the social structure no matter how unfair or harsh he may be. A Christian employee may be wronged by an unbelieving coworker or supervisor. For conscience’ sake, he must “take it” even though he is not in the wrong. A Christian’s relationship to God is far more important than his relationship to men. Remember Jesus' admonition & encouragement (Jn 16:33). A crooked master might used his power over a slave to inflict severe punishments, withhold wages or not pay fairly, force his slaves to live in squalor, or have other unreasonable expectations. It would take the indwelling Spirit's filling (Eph 5:18-note) and God’s grace (Php 2:12-note, Php 2:13-note, 2Cor 12:9-note, 2Cor 12:10-note, James 4:8-note) for Christian slaves to loyally and obediently serve such a master. Peter encouraged loyalty and perseverance even in the face of unjust treatment. These same principles apply to believers today & we too need the same enabling power and grace to comply. Wuest adds this note on the unreasonable masters: The masters had their faces dead set against these Christian slaves. We can understand that attitude when we remember that these slaves lived lives of singular purity, meekness, honesty, willingness to serve, and obedience in the households of their heathen masters. This was a powerful testimony for the gospel, and brought them under conviction of sin. All this irritated them, and they reacted in a most unpleasant way toward their slaves, whom they would punish without provocation. Yet they did not want to sell these Christian slaves and buy pagan ones, for the Christian slaves served them better. So they just had to make the best of the situation." Luke is referring to the tradition in which a monarch traveling in wilderness regions would have a crew of workmen go ahead to make sure the road was clear of debris, obstructions, potholes, and other hazards that made the journey difficult. In a spiritual sense, John was calling the people of Israel to prepare their "crooked" hearts for the coming of their Messiah. Peter appears to be quoting from (Dt 32:5) and (Ps 78:8 see below) Some 40 years later, many thousands from that "skolios" generation were to perish during the Jewish revolt which culminated in the destruction of Jerusalem in 70AD. On that day on that day, 3,000 Jews repented, believed, and were saved from the perverse generation. Moses describes Israel as those who "have acted corruptly toward (God). They are not His children, because of their defect; but are a perverse and crooked (Lxx = skolios = wickedly cunning, distorted) generation. (Dt 32:5). Application: God expects us to do our job not primarily for our employer but for God himself. What is your attitude toward your job? What is your state of mind toward your boss? Perhaps you say, "Well, my boss is about the most unreasonable, unrelenting, implacable and merciless man you have ever seen. He makes demands that are not just. It is impossible to please him. No matter how much I extend myself he still isn’t pleased." Still, the believer is to give his employer a full day's work. It matters not whether the boss is fair or whether he has a miserable personality. Greek: touto gar charis ei dia suneidesin theou hupopherei (3SPAI) tis lupas paschon (PAPMSN) adikos. KJV: For this is thankworthy, if a man for conscience toward God endure grief, suffering wrongfully. Wuest: for this subjection to those who are against you is something which is beyond the ordinary course of what might be expected and is therefore commendable, namely, when a person because of the conscious sense of his relation to God bears up under pain, suffering unjustly. There is no credit in suffering rightfully; the credit is in patiently enduring suffering, which you do not deserve. Not always “sticking up for his rights,” as an ungodly man says, but feeling that the greatest right in the world is the right to do without your rights. To suffer wrongfully, will often glorify God much batter than to stand up for what you have a right to be or to have. For (1063) (gar) explains "unreasonable" and provides a motivation for the submission Peter has just called for in (1Peter 2:18). Remember that every time you encounter a term of explanation, "PPP" (pause and ponder the passage). For one is regarded favorably (is approved, acceptable, and thankworthy) if, as in the sight of God, he endures the pain of unjust suffering. Some of the translations render the phrase for this finds favor as this is thankworthy (praiseworthy in the sight of God). Anybody, including an unbeliever, can “take it patiently” when he is in the wrong! It takes a dedicated Christian to “take it” when he is in the right because the human tendency is to fight back and to demand our rights. But that is the natural response of the unsaved person, and we must do much more than they do (Luke 6:32-34). Anybody can fight back; it takes a Spirit-filled Christian to submit and let God fight his battles (Ro 12:16-21-see notes Romans 12:16; 17; 18; 19; 20; 21). to an action that is beyond the ordinary course of what might be expected, and is therefore commendable. The unsaved slave would react toward unjust punishment in a surly, rebellious, sullen, vindictive manner. That would be the expected and ordinary thing. But Peter exhorts these Christian slaves to be obedient to these unjust and cruel masters, and when punished unjustly to behave in a meek, patient, and forgiving manner. This would be an action beyond the ordinary course of what might be expected, and would therefore be commendable. The motive for acting thus, Peter tells them, is “for conscience toward God.” The idea here is not that of conscientiousness in the ordinary sense, but of the Christian slave’s conscious sense of his relation to God. He has a testimony to maintain before his pagan master. He has the Lord Jesus Christ to emulate and reflect in his life. In summary, a slave who suffers, even though undeservedly, with the consciousness that he is following God’s will in what he is doing, will receive the blessing of God. If is what is referred to as a first class conditional statement which means that what follows is a fact assumed to be true. This is the lot in life for believers… the cross before the crown. The idea is not conscientiousness in the ordinary sense, but the conscious sense of one’s relation to God; his consciousness of God. Thus one suffers patiently, not from a conscientious sense of duty, but from an inner consciousness of his relation to God as a son, and to Christ as a joint-heir, which involves his suffering with him no less than his being glorified with him. What should motivate a Christian employee’s relationship with his employer independent of the employer's treatment is a desire to please God, motivated by a sense of a "Coram Deo" (before the face of God) type of awareness. How can I get a clear conscience? Suffering is not a blessing in and of itself, but, if one’s duty to God is involved (Acts 4:20), then one can meet it with gladness of heart. Bears up (5297) (hupophero from hupo = under + phero = bear) means to continue to bear up (from underneath), to endure, to sustain, to put up with, to underpin (to form part of, strengthen, or replace the foundation of as of a sagging building) despite difficulty and suffering. The principle is that we are able to get under a heavy load and carry it. The present tense indicates that bearing up under is this man's lifestyle, the attitude and the habitual practice of this person. For God, our God, moves on." A period of temptation and testing may be compared with a ship approaching a rocky shore and facing inevitable shipwreck. But, suddenly and, to the inexperienced landsman, unexpectedly, it slips through a gap on the inhospitable coast into security and peace and is thus being enabled to endure certain disaster. The Lord had not delivered from trouble, but He had delivered him out of the troubles. This is a reminder to us that we are not promised freedom from difficulties, but we are promised that the Lord will be go through the trial with us and He is faithful to see us through and to show us the way of escape that we might be able to bear up under the trial. Sorrows (3077) (lupe) is grief, trouble, sad plight or condition. It can refer physically to pain, suffering or distress or mentally or spiritually to sorrow, grief, sadness or anxiety. Grief is deep and poignant distress caused by or as if by bereavement (the state of being deprived or robbed of the possession or use of something). In the present context lupe summarizes all the difficulties a person experiences because of undeserved suffering. Suffering (3958) (pascho) means to experience a sensation or feeling which comes from outside of one's self and which has to be suffered. It means to undergo an experience, usually difficult, normally with implication of physical or psychological suffering. The present tense speaks of continual suffering. Given Peter's emphasis on trials and afflictions, it shouldn't be surprising that this verb pascho is used more often in 1Peter than any other epistle, with in fact 25% (10/40 uses) of the NT uses. Unjustly (95) (adikos from a = without + díkē = justice) means suffering injustice undeservedly, wrongfully or without good reason. Suffering which is not just, right or deserved and falls short of the righteousness required by divine laws. Treatment of slaves in the Roman empire was not charitable for the most part. Like thieves, runaway slaves were branded on the forehead (of course this would be suffering justly) . Others were imprisoned and many slaves died from mistreatment or imprisonment. It was however illegal to take the life of a slave without a court order. In some cases, a master might take out his anger on his slaves, even though the slaves had done nothing to incur any wrath (unjust suffering). Our case is like that of a criminal who had better bear quietly a sentence for a crime he has not committed, lest by too much outcry he induce investigation into a list of offenses, which are not charged against him, because they are not known. (Our Lord taught that) "you will be hated by all (why?) on account of My name, but it is the one who has endured to the end who will be saved… 24 A disciple is not above his teacher, nor a slave above his master." (Mt 10:22, 24). For to you it has been granted (verb derived from charis, grace and so it is a grace gift for Christ's sake, not only to believe in Him, but also to suffer for His sake, (Phil 1:29-note). We see in these verses the cost of submission to God and in turn submission to harsh masters. To be right with God has often meant to be in trouble with men. Tradition records that at the Nicene Council, not more than a dozen of the 318 delegates had not lost an eye or a hand or did not limp upon a leg shrunk in its sinews by the burning iron of torture. Is suffering for Christ always going to be a part of being a follower of Christ? What does the Bible say about affliction? KJV: For what glory is it, if, when ye be buffeted for your faults, ye shall take it patiently? but if, when ye do well, and suffer for it, ye take it patiently, this is acceptable with God. Wuest: For what sort of fame is it when you fall short of the mark and are pummeled with the fist, you endure this patiently? But when you are in the habit of doing good and then suffer constantly for it, and this you patiently endure, this is an unusual and not-to-be-expected action, and therefore commendable in the sight of God. A sense of injustice stings a man; he does not like to lose his rights, or to be buffeted when he has done no ill; but the Spirit of Christ teaches us to “endure grief, suffering wrongfully,” — to bear still, and still to bear. We are to be like the anvil; let others strike us if they will, but we shall wear out the hammers if we only know how to stand still and bear all that is put upon us. For (gar) - always pause to ponder this strategic term of explanation. What (4169) (poios) is an interrogative pronoun and can mean "of what kind?" as in this verse. Credit (2811)(kleos from kleo = to tell) means a good report, fame or renown. This verse is the only NT usage. Josephus uses kleos in his discussion of the prophet Balaam writing that God "had raised him to great reputation on account of the truth of his predictions"
The writing First Clement has the phrase "win fame for oneself". Harshly treated (2852) (kolaphizo from kolaphos = the knuckles or a closed fist and kolapto = to strike) means to beat or strike with the fist. To strike with clenched hand. Figuratively it means to cause harm, treat roughly or harshly (1Cor 4:11). Kolaphizo is in the present tense indicating continuous action, signifying that it was the habit of the "crooked" masters to "continually pummel" their slaves, the slave's only offense being that they had lived Christ-like lives which were used by the Holy Spirit to convict the harsh taskmasters of sin. Kolaphizo is used in (Mt 26:67; Mk 14:65) to describe the beating of our Lord & Savior Jesus Christ by the frenzied Jewish mob! Mark 14:65 And some began to spit at Him, and to blindfold Him, and to beat Him with their fists, and to say to Him, "Prophesy!" And the officers received Him with slaps in the face. 2 Corinthians 12:7 And because of the surpassing greatness of the revelations, for this reason, to keep me from exalting myself, there was given me a thorn in the flesh, a messenger of Satan to buffet me-- to keep me from exalting myself! 1 Peter 2:20 For what credit is there if, when you sin and are harshly treated, you endure it with patience? But if when you do what is right and suffer for it you patiently endure it, this finds favor with God. In other words, Isaiah is saying He was so marred that He almost did not even appear to be human! Peter may have been comparing the beating slaves often received with that which our Lord experienced and in the next verse he begins to describe His example to motivate his readers. Patience (5278) (hupomeno from hupo = under + meno = abide) (Related noun hupomone) literally describes the ability to abide or remain under not simply with resignation, but with vibrant hope. Who for the joy set before Him endured [hupomeno] the Cross despising the shame (Heb 12:2-note). Hupomeno is the ability to endure when circumstances are difficult but does not a passive sitting down and bearing things but a triumphant facing of them so that even out of evil there can come good, a bearing up in a way that honors and glorifies our heavenly Father. To show His power and grace. The Fruit of the Holy Spirit – What is patience? What does the Bible say about forbearance? What does it mean that love is patient? But (alla) is the strongest Greek adversative. Always pause to ponder this important term of contrast which marks a change "direction" so to speak. Ask what is the change? If - This introduces what is known as a first class conditional statement, one that assumes this is fact - Peter assumes as obedient children who are to be holy as God is holy, we will do what is right and we will suffer for doing what is right. That doesn't seem "right" nor fair, but as aliens and strangers we remind the lost that there is a God in heaven and there is a sure and soon judgment of every man by that righteous Judge. And so we suffer for Who we represent to the world. Do what is right is in the present tense indicating that this is to be our continual action (enabled by the Holy Spirit - cf Php 2:13NLT+)! The best way to respond to wrong is to do what's right. Suffer (3958) (pascho) means to experience a sensation or feeling which comes from outside of one's self and which has to be suffered. It means to undergo an experience, usually difficult, normally with implication of physical or psychological suffering. The present tense speaks of continual suffering. Click Torrey's Topic "Afflictions Made Beneficial"
This patience is not just "grin and bear it" patience but describes the patient and even cheerful (only possible because the joy of the Lord is our strength, Neh 8:10) endurance of maltreatment that is undeserved. At first, Peter had opposed Christ’s suffering on the Cross (Mt 16:21ff) but then he learned the important lesson that we lead by serving and serve by suffering. He also learned that this kind of suffering always leads to God's glory and God's favor! This thing (neuter) is thanks (verse 19) by the side of (para = beside) God (as God looks at it). Favor (5485) (charis) means unmerited favor, a gracious gift, an expression of thankfulness. In the present context charis refers more to that which bestows or occasions God's pleasure and delight. Why does patient endurance delight our Father? Because when we as "love" slaves of God live set apart (holy) lives, supernaturally empowered by His Spirit, such lives are a testimony and "advertisement" of God’s great mercy and grace to the "crooked" despot (v18). This passage surely bears the marks of Peter’s memories of that awful night when He denied His Lord. His exhortation to these Christian slaves is that when they are being unjustly pummeled by their masters, they should remember the Lord Jesus and how He was unjustly pummeled for them, and react towards their masters as Jesus did to those who mistreated Him. They are to take this punishment patiently, and this would be a delight to their Father. Illustration - The story is told of an elderly missionary couple who were returning home on a ship after many years of sacrificial service in Africa. On the same ship was Theodore Roosevelt, who had just completed a highly successful big game hunt. As the ship docked in New York harbor, thousands of well-wishers and dozens of reporters lined the pier to welcome Roosevelt home. But not a single person was there to welcome the missionaries. As the couple rode to a hotel in a taxi, the man complained to his wife, "It just doesn't seem right. We give forty years of our lives to Jesus Christ to win souls in Africa, and nobody knows or cares when we return. Yet the president goes over there for a few weeks to kill some animals and the whole world takes notice." But as they prayed together that night before retiring, the Lord seemed to say to them, "Do you know why you haven't received your reward yet, My children? It is because you are not home yet." It's natural to want to defend ourselves against injustice and to strike back. But if we're quiet and peaceful when others mistreat and persecute us, we are responding in a Christlike way. God wants to develop in us qualities that are unnatural for us. Anyone can be patient when everything's going his or her way. The greater virtue is to remain calm and controlled under provocation (1Peter 2:20). Fenelon, a 17th-century theologian, put it this way: "Don't be so upset when evil men and women defraud you. Let them do as they please; just seek to do the will of God … Silent peace and sweet fellowship with God will repay you for every evil thing done against you. Fix your eyes on God." He allows painful situations to come into your life, and according to Fenelon, "He does this for your benefit." For our benefit? Indeed! As we respond to injustice in a Christlike way, our anxiety, insecurity, and pessimism will be transformed into tranquility, stability, and hope. Why do we lash out when we're mistreated? Why are we so quick to defend ourselves or to seek revenge? Is it not that we place too much value on our own comfort and rights? And peace and justice will reign. TODAY IN THE WORD - Twelve Filipino evangelists visited a camp of Muslim rebels last July to pray for a group of hostages. The extremists decided to seize the ministers as well, keeping them as additional hostages. They were held captive for three long months. Finally, in early October, one of the evangelists escaped and was picked up by Filipino soldiers. After a brief battle between the soldiers and the rebels, the rest of the evangelists were also rescued, although the Muslims escaped with four other hostages. Because of the turbulent political situation in the southern Philippines, these evangelists endured a harrowing ordeal. But no doubt they viewed themselves as suffering for the Lord. Jesus never said that following Him would be easy! In fact, to follow in His footsteps means we can expect the same kind of treatment He received (cf. John 15:18-21). Peter taught that when suffering is unjustly received for doing good, then it is worthy of respect before God, no matter what people think. He even went so far as to say that believers are called to suffer. Why? “Because Christ suffered for you” (1Pe 2:21). Jesus set the example. He did not sin against His persecutors, nor did He deceive them, threaten them, or retaliate against them. Instead, He put His trust in God, the ultimate and perfectly just Judge (1Pe 2:23). The word example means that we are to imitate Christ in everything, in the same sense in which an art student reproduces a well-known drawing. In the big picture, because Christ suffered, we are to live holy lives, submitted to the will of God (1Peter 2:24; 1Pe 4:1-2). We can expect to suffer, as He did, and should count it a privilege to do so (Phil. 1:29). We know that our reward will be great in heaven (Mt 5:10-12)!